The 2nd Armored "Hell on Wheels" Division was an armored division of the United States Army. The division played an important role during World War II in the invasions of North Africa and Sicily and the liberation of France, Belgium, and the Netherlands and the invasion of Germany. 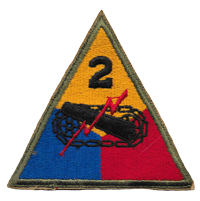 The 2nd Armored Division was formed and activated July 15, 1940, at Fort Benning, Georgia, with Brigadier General Charles L. Scott commanding with Colonel George S. Patton, Jr., in charge of training. It was created as a miniature army built around a tank brigade, commanded by one of the few ranking army officers in the country with actual tank combat experience, Colonel Patton. Patton’s military history linked him firmly to the new division. In World War I, “Old Blood and Guts,” then a colonel, commanded the 344th Tank Battalion. When General Scott was promoted to command the I Armored Corps in November 1940, that placed Patton, now a brigadier general, in command of the division. He promptly led his tankers in a series of maneuvers in Tennessee and Carolina, earning the division the name of “Hell on Wheels,” a title it was to wear in combat from North Africa to Berlin. The 2nd Armored was organized as a "heavy" armored division, having two armored regiments of four medium tank and two light tank battalions of three companies each. Along with the 3rd Armored Division, it retained its organization throughout World War II–the 14 other U.S. armored divisions were reorganized as "light" armored divisions, having three tank battalions, each consisting of three medium tank companies and one light tank company. Both types had an infantry component of three mechanized battalions, although the heavy divisions maintained an "armored infantry regiment" organization. The division was passed over to the command of Major General Willis D. Crittenberger in February 1942. He served with the First, Seventh, and Ninth Armies throughout the war. Two years of training paid off in September 1942 when, amid utmost secrecy, three invasion teams were formed within the division. From east coast ports they shipped out and elements of the 2nd Armored Division became a major part of what was then the greatest amphibious operation in history and among the first elements of the U.S. military to engage in the Allied invasion of French Northwest Africa, November 8, 1942. In three days, the division, now under Major General Ernest N. Harmon, led the dash of General Patton's Western Task Force from the beaches to victory along with the 1st Armored Division. They were part of the Western Task Force of Operation Torch, which landed at Casablanca in French Morocco. The remainder of Torch's American component were the 1st, 3rd, 9th and 34th Infantry Divisions. However, the 2nd Armored Division did not see much action in North Africa and instead remained in French North Africa on garrison and training duties. In April 1943 Major General Harmon relinquished command of the division to Major General Hugh Joseph Gaffey. Training in amphibious operations began in preparation for an amphibious landing at Sicily. “Hell on Wheels” earned its second bronze arrowhead, given for an assault landing, 10 July 1943, when it hit the shores of Sicily to launch two weeks of bitter fighting. As the reserve force of the Western Task Force of Operation Husky, codename for the Allied invasion of Sicily, the division landed on 10 July in support of the 1st Infantry Division at the Battle of Gela. Afterwards, the division next went into action in the second landing at Licata, Sicily on 21 July following the 3rd Infantry Division's better-known earlier landing on 10 July. The 2nd Armored, operating closely with paratroopers of the 82nd Airborne Division, then fought through to the Sicilian capital of Palermo. Along the way the 2nd Armored Division captured thousands of Italian prisoners of war (POWs). The fighting in Sicily came to an end on 17 August, with the 2nd Armored Division having sustained relatively light casualties in the brief campaign. The “Iron Deuce” pushed the enemy from the beaches into the rugged mountains, dug them out of the hills, and pushed them finally into the ocean. Among its victims was the elite Nazi Herman Goering Panzer Division. The 2nd Armored Division gained its first Medal of Honor of World War II, belonging to Sergeant Gerry H. Kisters. During the campaign the division came under the command of the U.S. Seventh Army, under Lieutenant General George S. Patton, who had been a former commander of the division. Just over a year from the date the division began its assault on North Africa, and shortly after Operation Husky it sailed from Sicily for England, to take over new and more up-to-date equipment, and to begin preparation for the biggest amphibious operation of them all - the Allied invasion of Normandy and Europe. The division remained and trained in England until June 1944. In April, the division received a new commander, Major General Edward H. Brooks, a decorated veteran of World War I, replacing Major General Gaffey. The 2nd Armored Division landed in Normandy, on Omaha Beach on 9 June 1944, three days after the initial Normandy landings, and operated in the Cotentin Peninsula and later formed the right flank of the Operation Cobra assault. The division encircled the Waffen SS division Das Reich and the 17th SS Panzergrenadier Division Götz von Berlichingen around Roncey. In the process Das Reich and the 17th SS Panzergrenadier Division Götz von Berlichingen lost most of their armored equipment. There was the St. Le-Vire River line, where the 2nd Armored Division engaged elements of 14 enemy divisions, who tried but couldn't stop “Hell on Wheels.” There were countless other tiny French villages that became symbols of the Allied cause as the war rolled over them in the charge that catapulted the 2nd Armored through a 90 mile stretch of France to the Seine in six days. On 2 September, the division was the first Allied unit to enter the Nazi-occupied country of Belgium, climaxing a 60 mile, 36 hour drive from the Somme River. It blunted the German attack on Avranches, then raced across France with the rest of the Third Army, reaching the Albert Canal in Belgium on 8 September. It crossed the German border near Sittard, 18 September to take up defensive positions near Geilenkirchen. On 3 October, the division, now commanded again by Major General Harmon for the second time and while in the “Celles Pocket,” during the Battle of the Bulge, “Hell on Wheels” destroyed the Nazi 2nd Panzer Division, after a call for help had sent the division racing 75 miles overnight to the aid of its comrades-in-arms reeling under the enemy's greatest counteroffensive of the war. The division launched an attack on the Siegfried Line from Marienberg, broke through, crossed the Wurm River and seized Puffendorf 16 November and Barmen 28 November. The division was holding positions on the Roer when it was ordered to help contain the German Ardennes offensive. The division fought in eastern Belgium, blunting the German Fifth Panzer Army's penetration of American lines. The division helped reduce the Bulge in January, fighting in the Ardennes forest in deep snow, and cleared the area from Houffalize to the Ourthe River of the enemy. The German 2nd Panzer Division was on its original mission to the Meuse River and mechanized units of this Panzer Division ultimately ran out of fuel at Celles, where they were destroyed by the U.S. 2nd Armored Division and the British 29th Armoured Brigade. After a rest in February, the division, now commanded by Major General Isaac D. White, led the division as it raced through crumbling Nazi defenses to the Rhine and crossed it on 27 March. As it reached the Rhine at the German city of Uerdigen, 2,500 prisoners were taken, 37 tanks destroyed and 265 assorted guns demolished. Then the division’s engineers, under enemy fire, set a new speed record for bridge construction, spanning the Rhine with a 1,152 foot bridge in seven hours. On Easter Sunday, April 1,1945, “Hell on Wheels” linked up with the 3rd Armored Division to complete encirclement of more than 350,000 enemy troops in the vast Ruhr industrial complex. Three days later, the division jumped the Weser River and swung north to the outskirts of Hamelin, the town of the legendary “Pied Piper.” The final 57 miles of the Division’s advance to the Elbe, on April 11, was the greatest fighting surge of “Hell on Wheels” of the war - 57 miles in 12 hours. and was the first American division to reach the Elbe at Schonebeck on 11 April. It was halted on the Elbe, 20 April, on orders. In its campaign from the Rhine to the Elbe, the Iron Deuce had overrun 3,000 square miles, captured 45,000 prisoners, disposed of huge volumes of enemy supplies and munitions. Following destruction of a last-ditch enemy effort by Task Force Von Clausewicz, the war ended for the 2nd Armored Division. It settled down to military government duties. On the basis of its outstanding combat record, on 4 July 1945, the division now commanded by Brigadier General John H. Collier was the first American unit chosen to roll into the shattered Nazi capital, Berlin, nearly five years after it was organized and the Division's standards fluttered campaign streamers for North Africa, Sicily, Normandy, Northern France, Ardennes, Rhineland and Central Europe. Along the bloody trail that marked the division’s advance, more than 1,100 members of the Iron Deuce had died. Nearly 6,000 Purple Hearts decorated the Tunics of the Wheelsmen. For their heroism and valor, units of the division received 19 Distinguished Unit Citations. “Hell on Wheels” had thundered more than 1,700 miles of combat advance. Members of the Division received 9,369 individual awards, including two Medals of Honor, twenty-three Distinguished Service Crosses, and 2,302 Silver Stars as well as nearly 6,000 Purple Hearts; among those receiving the Silver Star were Edward H. Brooks, Hugh Armagio, Stan Aniol, Staff Sergeant John J. Henry, William L. Giblin, Neil J. Garrison, Morton Eustis, son of William Corcoran Eustis, and Sgt Kenneth E. White. The division was twice cited by the Belgian government and division soldiers for the next 50 years wore the fourragere of the Belgian Croix de Guerre. In Berlin, the 2nd Armored became the honor guard for the President of the United States during the Potsdam Conference held between July 17-August 2, 1945. The United States, United Kingdom and Soviet Union were attendees during the Potsdam Conference. General Patton, former commander of “Hell on Wheels” also attended. This was to be General Patton’s last appearance with the division before his untimely death a short time later. Six months later, 1946, the division staged a triumphant return to the United States, and moved to Camp (now Fort) Hood, Texas, to rebuild and retrain as America’s only peacetime armored division at the time. There are 76 soldiers of the 2nd Armored Division World War II still listed as missing in action.